Top Annapolis, MD Hotel Near US Naval AcademyEnjoy a comfortable stay at the Holiday Inn Express and Suites Annapolis that is conveniently located four miles from Historic Downtown Annapolis, U.S. Naval Academy and St. Johns College. Located off Highway 50 and I-97, you will love access to attractions including the Navy-Marine Corps Memorial Stadium, Sandy Point State Park and Westfield Annapolis Mall. Walk to Annapolis Towne Centre, featuring Whole Foods, upscale dining, including P.F. Changs China Bistro, and free summer concerts. A short drive away from the beautiful Chesapeake Bay, our Annapolis hotel keeps you near a variety of activities, from visiting the Chesapeake Childrens Museum to sailing along the bay and eating fresh seafood for dinner. Business travelers lodging in our Annapolis accommodations will not be disappointed in the Holiday Inn Express Annapolis hotel experience. 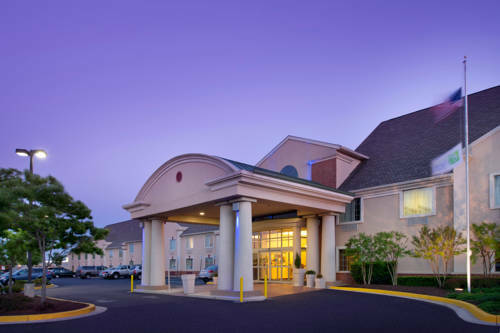 Just 21 miles from Baltimore-Washington International Airport (BWI), we provide easy access to over 6,000 businesses and corporations in downtown Annapolis.Our accommodations also offer free high-speed Wi-Fi, Keurig coffee maker and mini-fridge. Enjoy 24-hour Business Center and a free laundry room to meet your needs. We will treat you to a complimentary hot breakfast bar each morning and cozy triple-sheeted beds. Maintain your workout routine at our 24-hour Fitness Center, or upgrade to a whirlpool suite for an in-room relaxation experience. Brio Restaurant: Brio Restaurant is a casual white tablecloth or fine casual restaurant, which serves lunch and dinner. They are known for their italian dishes, high quality food and superior service. Annapolis Towne CentreAnnapolis Towne Centre, within walking distance from the hotel, are great shops and dining to include PF Changs, Chop House, The Melting Pot, Gordon Biersch, Restoration Hardware, Brooks Brothers, Target, 24 Hour Fitness, Whole Foods and much much more. Eisenhower Golf CourseEisenhower Golf Course, four miles away, is a parkland style course with 18 holes, par 70 and stretches to 6,659 from the tips with four different sets of tees for golfers of various abilities. Call 410-571-0973 for tee times. Renditions Golf CourseEnjoy 18 holes of championship golf from holes inspired by holes from major championships. Call 410-798-9798 for tee times. Renditions, 10 miles from the hotel, has a pro shop, lounge, driving range and practice green/short game area. Annapolis Maritime MuseumThe Annapolis Maritime Museum has provided state-of-the-art waterfront educational facility. This also will include classrooms and a exhibition gallery. They also have a hall that you may use for classes, lectures & concerts. Banneker-Douglas Museum of African-American LifeThe Banneker-Douglass Museum is dedicated & conserved to the Maryland s African American heritage. This museum every twelve months sponsors and hosts a diversity of preservation, arts, and educational lectures, workshops, performances, and other programs. Chesapeake Childrens MuseumChesapeake Children s Museum is a place for children to be able to come in enjoys being a kid. This museum teaches children about history, geography, and science. Maryland State HouseThe Maryland State House is the oldest state capitol in constant lawmaking use. Watermark Cruises and Charter ToursThe watermark is a place where you can enjoy yourself by being on land or on the water. They strive to give there guest a truly genuine Annapolis experience. Westfield Annapolis MallWestfield Annapolis Mall is a beautiful place to get all of your shopping done. This mall has over 240 stores which would include names as such as Macy's,JC Penney, Lord & Taylor, and Nordstrom. Annapolis City DockRelax by the water and enjoy the beautiful sceanery Downtown Annapolis has to offer. Sandy Point State ParkSandy Point Park has 786-acre which is located along the Northwestern shore of the Chesapeake Bay. It has beaches and picnic areas that are well known for their breathtaking scenic water views. Maryland State Capital BuildingThe State Capital Building is a place with a full range of design, permitting & construction services. It includes designs for the roads, environmental features & pools. Six Flags AmericaSpend the day at exciting Six Flags America, rides, entertainment, food fun and Hurricane Harbor water park. Four Centuries Walking TourThis tour allows you to see the historic Annapolis, explore the interior of the Maryland State House and be inspired by sights and sounds of the U.S. Naval Academy.